Take a heavy bottom vessel add water and jaggery.Let the jaggery melts for 5-10minutes. Cook on a medium heat until syrup begins to concentrate.Take a small plate with water,add the jaggery syrup,if you can make a ball of it then the syrup is ready. Add murmura and constantly stir it.Now add elachi powder.Within 2-3 minutes murmura and jaggery gets mixed up. Wait for 5 minutes,wet your hands with little water and make round balls. 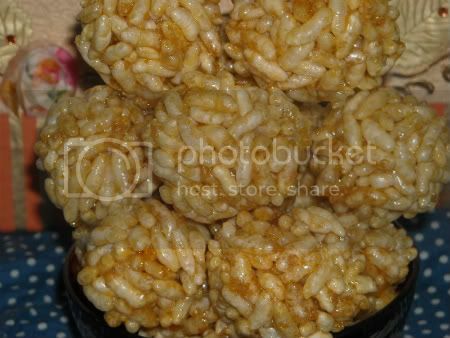 These are very easy to make and even kids can do it.The above laddus are done my daughter. wow.. nice balls.. looks really nice & crispy.. I remeber having them in my childhood Varunavi..that made me nostalgic..yummy yum..!! Hey, i love this but its little tricky for me. 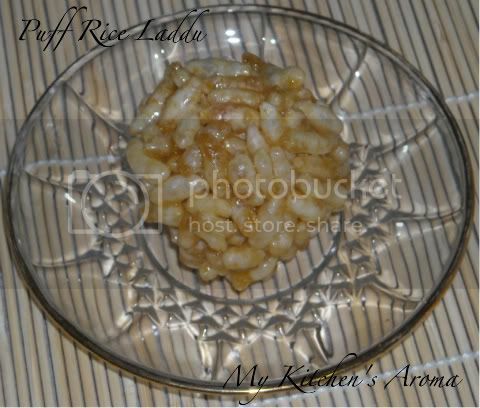 Each time i try this neither the rice puffs gets soggy nor too sticky. But yours is crispy and munchy. Great! One of my fav... looks great..
its my fav too......turned out great! Your daughter indeed have made them very nice. Looks delicious. 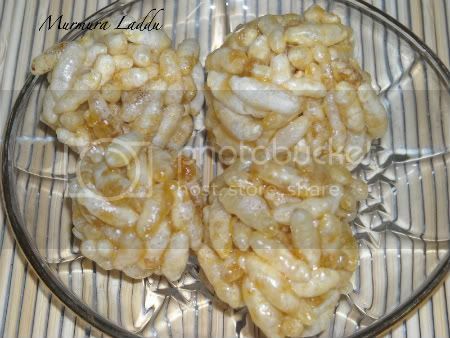 i remember eating these goodies in india in my homwtown while growing up..yours looks same as we use to get from the store..
Just love this Saritha, one of my weakness! I love this. Turned so perfect. Looks yummy and tempting. I absolutely adore these..I remember going to the street corner store and buying themfor a few pennies!These came out so perfect! wow nice, Pinky did it? ?